…about life, the universe, and everything. Don't panic! 1. Delete Twitter and spend newly free time in transcendental meditation. 2. Start classes for my new bachelor’s degree in Mathematics and Applied Physics. 3. Open and become president of a local chapter of the Lady Gaga Fan Club. 4. Give up all caffeine. Decaf or die! 5. Memorize the dialogue from all four Twilight movies. 6. Become a hermit and give up outings to Buffalo Wild Wings. 7. Commit to sobriety. So much joking around is not becoming at my age. 8. Renounce blogging, and begin a MySpace instead. 9. Quit reading, cold turkey. 10. Stop teasing my awesome blog readers with this list, and promise to be a better blogger in 2012. Well, one out of 10 ain’t bad! (Guess which one I’ll actually do???) Please feel free to leave your resolutions, real or imaginary, in the comments. Have a safe and happy start to 2012!!! It has recently been brought to my attention that my blogging of late is…spotty, at best. Naturally, this is due to an amazingly complex life workload right now, and (if we’re being honest) a general lack of inspiration. But no more! Today marks my last first-day-of-a-session, and I intend to milk these last eight weeks of university for all they are worth. This morning, I started Hebrew. After a long struggle with Greek, Hebrew seems even more incomprehensible (if that’s even possible). 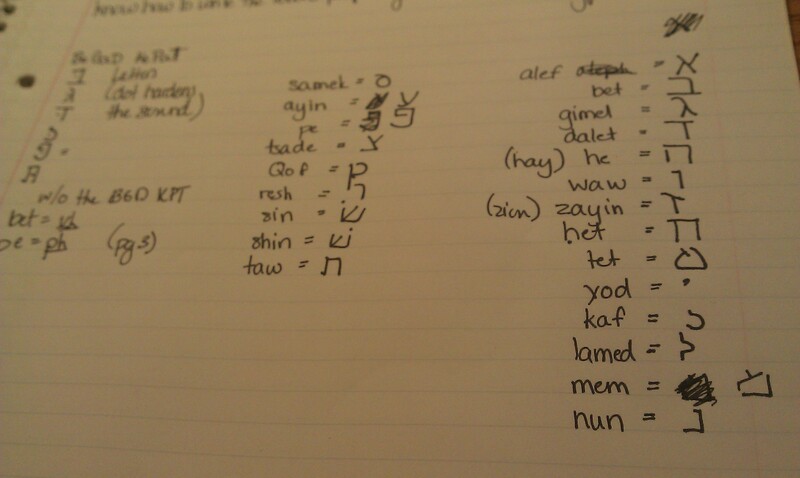 However, I’ve always wanted to learn Hebrew, so I’m attacking it like it’s a language out of a fantasy book. So what if it bears no relationship to English??? A dalet totally reminds me of the word Dalek…this is doable. Oh! Here’s a picture of what I did in class this morning! I’m continuing with Oral Communication, the only class that is staying the same over the whole semester. It’s a great class though, almost a brain break of sorts. Really, the class should be called The Art of Storytelling, because that is what we do. We read about orality and the ideas of oral culture (slightly ironic, I know), and then we tell stories! Next week we have to tell either a Teaching or a Vision story. I’ve not yet decided which I’ll go with, but so far all of my stories started out as blog posts here. Look at you all, helping me get an A in this class! We are reading this really great book by Walter Ong titled Orality and Literacy that is awesome! If you’re a word/language-geek looking for an interesting read, I encourage you to pick it up! This guy is scary smart. Last, but not least, I’m doing Mystery Fiction! Due to being one of the first English majors on campus (and helping start the English Club as well), I’ve spent quite a bit of time in the English Suite talking with our awesome English professors. (By the way, that sentence just won an award for overusing the word “English.”) During one of those chats, I was asking our department head about the likelihood of creating certain courses. One of the things I asked about was a mystery class. I’m a huge fan of the genre, and I thought that it might be fun. While I was told that there were no plans to create such a course for the university, the department head mentioned that she had taught such a class at another college in the past. Fast forward to last May when I realized that my current degree plan left room for one more elective course. Problem was, I’d taken any and every class that I was even slightly interested in. So, I casually asked the department head if she would be willing to do an independent study with me. She was! So there you have it…the brief and tedious history of my university’s first Mystery Fiction class. A bit heavy on the British side of things, but we both prefer British literature anyway, so it works out. I also have two supplementary books for the class: The Perfect Murder, and Bloody Murder. I’m sure after ordering those two books that I’m now on some Amazon watch list. Also, please ignore the fact that I’m ordering from Amazon. Desperate times and all that jazz. Add to that teaching British Literature twice a week, American Literature twice a week, a few music students, and 20+ hours at Starbucks, and I’m really in for an exciting two months. Oh well…l’chaim! Want to know when I put up a new post? You know you do! No spam ever- just pure bloggy goodness from me!